Nature Conservancy Australia contacted me in June to see if I’d be interested in being a judge for this year’s Nature Photo Competition. Of course I would! I’ve admired the work of the Nature Conservancy in the US for years. They also spread their activities around the globe and have successfully protected over 48 million hectares of land and thousands of kilometres of rivers. What I particularly like about the Nature Conservancy is how they do it all in scientific collaboration. They have a strong business sense too. They don’t take on every project, but focus on those which have a certainty of success and greatest impact on long term survival of all biodiversity on earth. Here in Australia, they have not been at it as long, but are growing by leaps and bounds every year. So of course I was delighted and honoured to be involved. I thought I would share my thoughts on some of the winning images. Maybe this will give you insights into how judges think and get you planning your own winning images, whether for entry in the 2017 competition or for other purposes. To me the outstanding winner in the Water category was the whale with the watchful eye. It was exceptional. It was an image that said “water” strongly. I have never seen a whale photo like it. When you examine the photo closely, your eye finds more and more detail to discover. 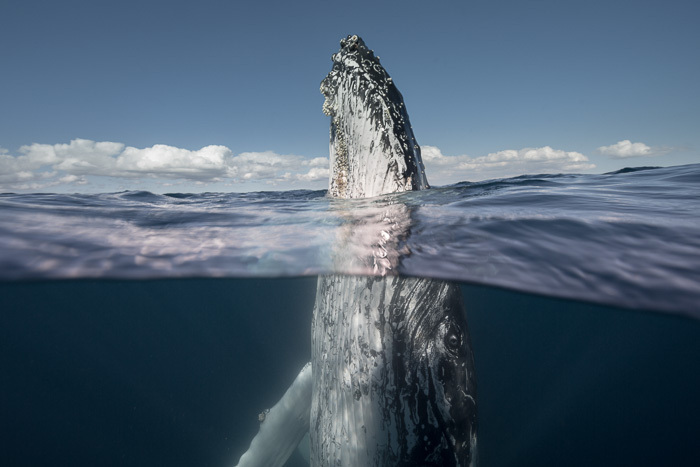 The eyes of humpback whales are normally hidden and shaded, so it is unusual to find one “looking” with such a strong, clear gaze. It is also in such an unusual position, dead vertical, with only its snout out of the water. Again something that is not common humpback behaviour. It was a tough call for the photographer to put this image in the Water category instead of the Wildlife one. But the way this says “water” to me is in the buoyancy of the whale; he’s playing in/with his element, he is a master of his domain. There were many entries with long boardwalks extending into the sea, with sunsets, with people, etc. What make this image stand out from all the rest? On close examination, one can see how this one differed from all the others and captures a brief, but special, moment in time. It is startling in its composition of all the converging diagonal lines. Not only do several pairs of lines meet at one point, but they also meet in the centre of the frame. This type of “formal composition”, as is called, does not always work as it can be too static. In this case, that composition has created complete stillness. At the dead centre of the convergent point is a figure. It is bulky, quiet and definitely not posed. Sometimes when everything is happening at one point in the frame, the rest of the picture can be neglected. That has not happened in this case and it remains full of interest. The horizon line has detail, plus there are repeating patterns in both the boardwalk and the side rails. The use of colour tops off the image. Blue and amber are complementary colours, and in this case are not over manipulated but are left subdued to create a soft mood. 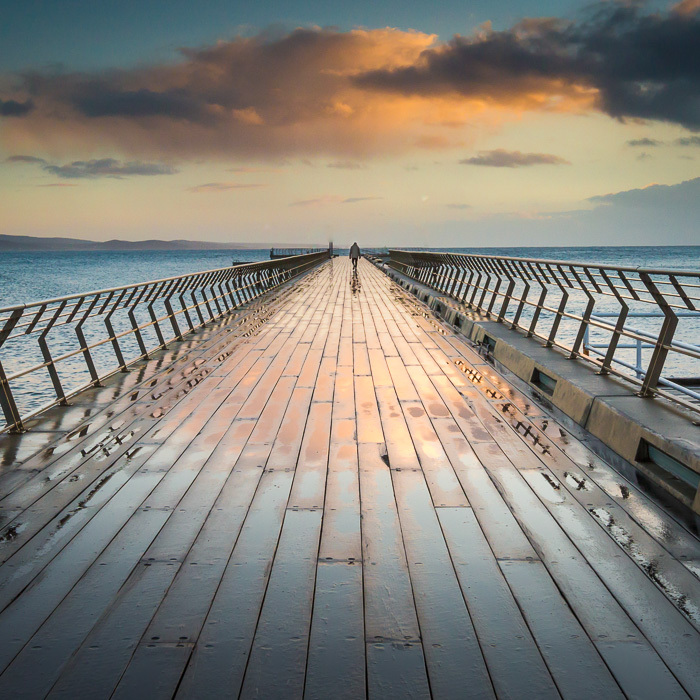 The warm sky is reflected in the wet boardwalk and creates a glow around the figure, as if it is being embraced. This was done on a mobile phone? Hard to believe isn’t it? Mobile phones are notoriously bad at capturing dark scenes, or at least dark shadows. More difficult still is trying to get a wide dynamic range, as in this one, to record both the bright highlights (the lightning) and the deep shadows. 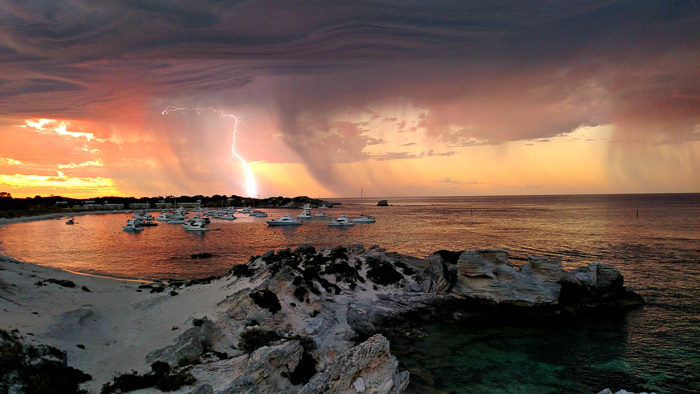 Even if it was done in post-processing later, the photographer is still a genius. Arcs of rain sweep across the horizon. That alone would have made a great moment in nature, but there is also that startling band of lightning among the arcs. Interestingly, the lightning falls just on top of the cluster of boats so our eyes are directed to this important part of the frame. It’s hard to frame tightly on a scene because there is no zoom option on a mobile phone. So the photographer did a good job of using the wide angle of a mobile phone by bringing in the foreground elements of rocks and sand. This image got my winning vote in the Landscape category for the simple reason of its uniqueness. It is an interesting landscape with silhouetted trees and water. The down point is that you there are no defining features of the landscape to tell you where it is, other than it’s a flooded lake. But what makes it a winner for me is the balance of the two complimentary colours blue and amber. The blue side is moody, the amber side is dramatic. 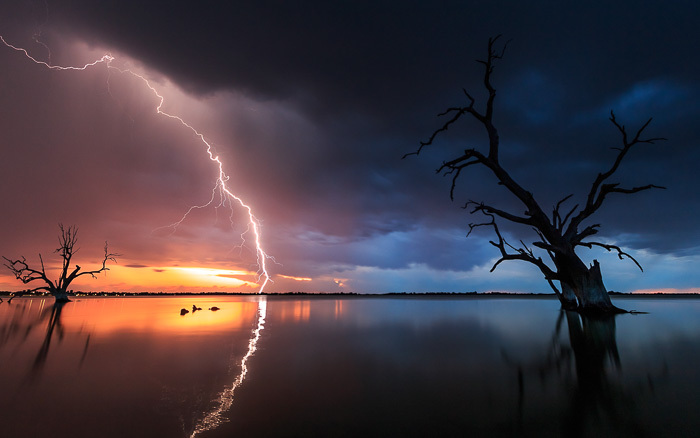 The arc of lightning is reflected in the water making a smooth C curve. Because it’s off centre it doesn’t divide the frame into two equal halves. The arc make by the silhouetted tree on the right creates repetition with the arc of the lightning. The brightest part of the image, where the eye is naturally drawn, happens to have three objects in it, an interesting number and such a fluke of nature could not have been predicted. The fact that the sun has not yet set, plus it’s a stormy evening, shows that a lot of preparation went into this shot. 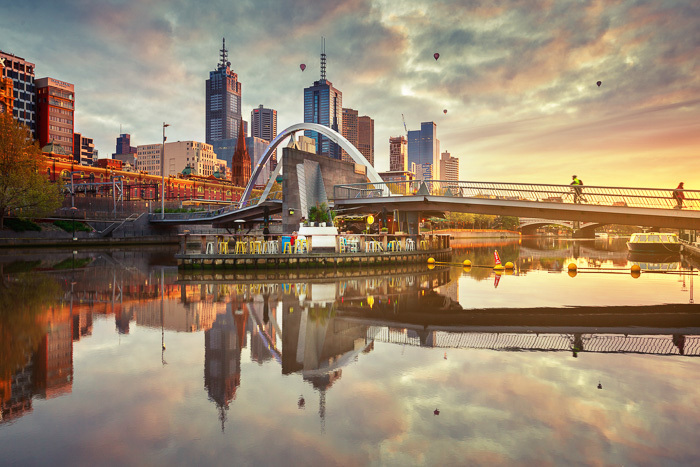 This image of Melbourne – or is it Brisbane? – I’m not sure, but it doesn’t matter because the image is pure fairyland. The warm soft hues remind you of a child’s dream of heaven. The city is reflected perfectly in the calm river. The atmosphere thus created is a result of post-production technique called “high dynamic range” or HDR. Most photographers go overboard with it, but here it is applied with discretion and intelligence. The photographer has used just enough to create a graceful, ethereal quality. That character is punctuated by the balloons rising into the sky, completing the birthday party atmosphere. Do you see the insect in its claw? It’s either a preying mantis or a sick insect. 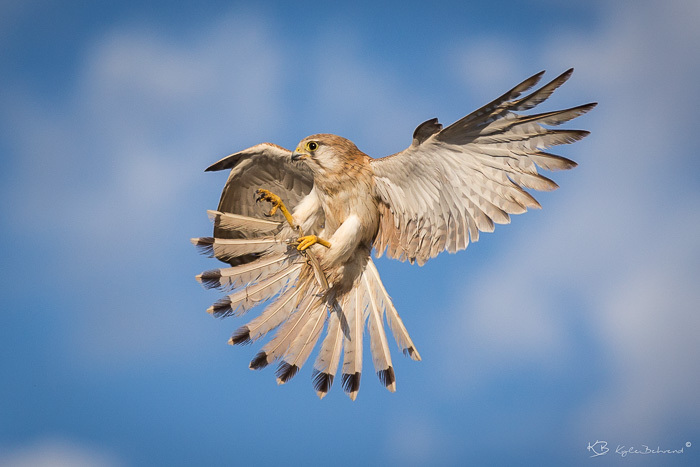 Obviously this Australian, or Nankeen Kestrel is bringing food to its young chicks. The photographer has caught the bird just as it’s about to land at the nest. I think it was interesting composition to not include the nest / tree / building. We’re left to image it and our concentration is now exclusively on the bird. And what makes this true to my photographer’s heart is the achingly sharp clarity throughout – totally in focus, from beak to feathertip. If you are interested in their work, outside the photo competition, then they would welcome you to support some projects, like the desert lands, northern savannahs, Murray-Darling wetlands, and the southern seascapes. I hope you enjoy these innovative and beautiful expressions of nature. They truly do a great job of drawing our admiration of Australia’s biodiversity and remind us of what a privilege it is to be a caretaker. So it’s your job now to get out there with your camera, even if it’s a mobile one, and capture some amazing pics.